We went to a grandson’s hockey game recently. At first we both groaned at rushing off on a Saturday a.m. to sit in the cold clime of a hockey arena to watch enthusiastic 6-8 year olds skate with grace and fury, and push a puck around with equal zeal. Ours was #137, the only way to identify him behind the gear. He is the smaller of our two grandsons who play ice hockey. Ice hockey rankings for kids are by age group and metaphorical size. This lad, Thomas, is in the youngest age group and is a mite at age 8. Next year he will be a squirt, then graduate to peewee then bantam. God knows what could follow that? Here he is with the smallest (in size) and youngest (6) player on his team. 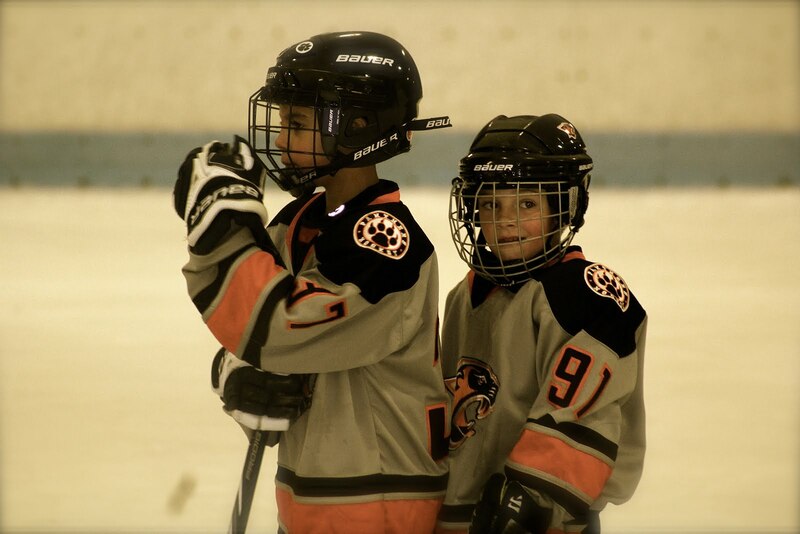 Another grandson, Will, started hockey when he was about Thomas’s age. Will is now 13 in pee wee status. He chose this sport over others, because he is a fast and lithe skater (smart), and because this sport has the most protective gear (also smart)! !—also, the most expensive gear, his dad notes. When we went to one of Will’s squirt games, I winced and ducked and feared for his precious young life. Hockey has a reputation for violence—part of hockey DNA. I found out later that there are well enforced rules about blocking tactics called checking. There are eleven different ways, some illegal, to check your opponent’s movements—none of them verbal. How fierce is that? But I’m pretty sure this boy will not aspire to the Boston Bruins. Here he is #3 (nice spiritual number) playing a championship game. When we went to Thomas’s game, I noticed some girls playing. Oh well, we wanted equality, didn't we? The team playing against Thomas’s was an all-girls team. The players were from many different towns in Massachusetts. I was impressed. These girls were aggressive, and some of them looked to be well over mite size. I knew they were legally sized, though. These mites, boys and girls all played their souls out. The girl goalie had perfected the art form of splaying her hips to simply sit on the puck as it came her way. Legal or not, it worked. I knew women had broad hips for a reason! The boys usually beat this plucky all-girls’ team, but this day the girls won at the very last minute by 2 points The boys’ team had even “left an empty net” so they could release another skater, the goalie, to make that one more goal for a tie or a win. But the girls prevailed and a whoop went up. I felt conflicted. I'd rooted for Thomas’s team of course. Yet I also felt happy to see an all-female team win. Suddenly I realized, in a raw moment of truth, how small my own gender agenda really was. All these children were good skaters, earnest and honest players, full of joy at winning and deflation at losing. They’d all be back next week, eager to play again, renewed and refreshed and full of the exact same quotient of energy to contribute to the game and this team as they had this week. I knew this to be true for each individual player, as well as for the human spirit in general, when Thomas said to his dad, “When’s the next practice?” That’s a win.